How Long Does a Foreclosure Stay on Your Credit Report? With all the foreclosures sprouting up, struggling homeowners that are either going through the process or teetering on the brink may be wondering what the repercussions are, aside from the obvious, losing your home. Well, with regard to credit, foreclosure is a very serious delinquency, and one that will stay on your credit report for up to seven years (typically from the date of filing). The filing date for a foreclosure may be the Notice of Default (NOD) in a non-judicial state such as California or the Lis Penden (written notice of pending lawsuit) in a judicial state like New York. Initially, the foreclosure will hit your credit score big time, likely dropping it more than 150 points, pushing even the most prime borrower into subprime status. The amount it will drop will vary based on your credit history. If your credit score was essentially flawless, you’ll see a larger drop. If your credit score was already dinged up, the drop won’t be as severe. However, as time goes by, your credit score will inch up, assuming you continue to pay your other bills and meet other commitments in a timely fashion (this is key to recovery). Be sure not to miss any subsequent payments, or you’ll set yourself back. Even on unrelated credit tradelines, such as a credit card or an auto loan/lease. The presence of the foreclosure record on your credit report doesn’t mean you can’t obtain mortgage financing for seven years, but it does mean creditors will be able to see the red flag and punish you accordingly. Even if you meet the bank or lender’s requirements for past foreclosures, an underwriter could still determine that you are too risky for a subsequent mortgage if you’ve got other iffy stuff going on. You may also be subject to more stringent guidelines going forward, like no stated income documentation and a larger down payment requirement. Keep in mind that the longer you put off foreclosure, the longer the recovery period; that’s not to say give in, but take note. Like any other derogatory credit account, it’s possible to get a foreclosure removed from your credit report, though you’ll probably need a compelling reason and a whole lot of legwork. But it could certainly be worth your time. Plenty of homeowners fight to get foreclosures reversed due to faulty paperwork and other lender and loan servicer shortcomings. If you’re able to do so, be sure to get everything in writing so you can get the foreclosure removed from your credit report as well! How Does Foreclosure Affect Your Credit? Now that we discussed how long a foreclosure can impact your credit score, let’s talk about how a foreclosure affects your credit. Knowing more about how it works can help you better cope and deal with it. Unfortunately, credit questions are never black and white, mainly because every consumer has a unique credit profile, making it impossible to pinpoint credit scoring impact across the board. But FICO released some interesting data recently regarding the effect of foreclosure on different types of consumers and their credit scores, shedding a little light on an often disputed topic. A big driver of the credit score damage has to do with where you stood before the event took place. Context is everything. Well, it’s a lot. What Was Your Credit Score Before the Foreclosure? The company looked at two different credit profiles, one average (680 FICO score) and one excellent (780 FICO score) to detail how a foreclosure might affect your credit. Despite the two consumers having initial FICO scores that were 100 points apart, which is pretty day and night, post-foreclosure, those very same credit scores would only differ by about 50 points. Seems pretty unfair, doesn’t it? Borrower A would see their credit score fall to between 575-595, while borrower B would see it slip somewhere between 620-640. That’s a 100 point drop for the average credit score and a 150+ point drop for the homeowner with previously excellent credit. You may be wondering why borrower B would take a bigger hit for the same derogatory event. Well, it’s simple really. Because borrower A’s 680 credit score already reflects past risky behavior, the somewhat higher possibility of a foreclosure is already factored in. Meanwhile, borrower A’s foreclosure would be viewed as an unexpected and unforeseen event, and as a result, would impact their credit score pretty significantly. It’s kind of like that old adage, the bigger they are, the harder the fall. And though the gap would narrow between the two consumers, borrower A would fall into subprime status (credit score below 620), while borrower B would still have a credit score in what some call the Alt-A realm. So there is still some distinction, despite the two credit scores being pretty close together post-foreclosure. Of course, both borrowers would still be subject to the same rules with regard to obtaining a mortgage post-foreclosure, so those three-digit numbers don’t necessary have as much value as you may think. However, your credit score will be instrumental in obtaining other types of credit, such as an auto loan, credit card, insurance, and so forth. For the record, this is just one example of the potential impact of a foreclosure and credit scoring can vary widely. Keep in mind that those who are eventually foreclosed on will have missed mortgage payments on their credit report first, so their credit scores will probably already be depressed before the foreclosure is factored in. And many borrowers who are facing foreclosure may also have other missed payments on their credit report seeing that they are in distress, so those must be taken into account as well. 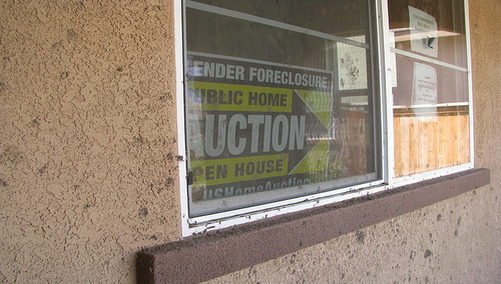 Read more: Foreclosure waiting periods. Quick question, I had a foreclosure on my credit report( conventional loan 80/20) first and second loan showing on my report. When I pull out my credit report it shows the date, month and year when it will be removed. My question is, will the foreclosure removed at the date reflected on my report or it can be extended ( I believe its almost 7 yrs now). It should be removed seven years from the filing date, as mentioned in the article. I forclosed on a house due to the entire kitchen was sinking into the ground as whoever added the kitchen on took advantage of the elderly lady that lived there and built it right on the ground then it began to sink i had 2 professional people come in to see what it would cost to fix it and all 3 said between 40-50 grand and i was paying 50 grand for the house so there was no way i could afford that so we left and it was forclosed on one report said it would be removed on a certain date and another one said it was closed. Will it always be on my report? As noted in the post, it can remain on your credit report for up to 7 years, not forever.